As Antarctic ice sheets grow, warmists claim it's due to global warming! Recent news stories about the modern-day record extent of Antarctic ice came with the usual caveats from warmists claiming it was all because of global warming. Really? Well, there are some inconvenient facts that fly in the face of this warmist claim. While the record hiatus of global warming continues unabated toward the two-decade mark, warmists who cling to their discredited theories propping up claims of human-caused-global-warming are grasping at every opportunity to invoke their "chicken-little" claims of catastrophic global warming. A recent news story documenting the modern-day record extent of Antarctic ice sheets came with a caveat from the warmist deniers of real climate. Essentially, warmists are claiming that, despite the growing ice sheets over oceans surrounding the continent of Antarctica, the snow cover on the continent is diminishing, and it is all because of human-caused-global-warming, despite nearly two decades of no global warming of any kind, human or otherwise! Well, let's consider the likelihood that somehow, the air over Antarctica is warming while the rest of the planet is not and that this warming is causing the snow and ice cover of Antarctica to diminish. None of these average or record high temperatures during the South Pole's warm season begin to approach the melting point of water. But the claim being made by warmists is that continental snow and ice are melting! Bear in mind, these data are for the South Pole, which is well inland on the Antarctic continent where melting is claimed to be occurring. Looking at the entire continent of Antarctica, while warmest temperatures occur along edges of the continent, "summer temperature is below 0°C (32°F) most of the time." It is also worth noting that the highest temperature every recorded on the Antarctic continent was 15°C (59°F) on January 5, 1974, in the fourth decade of global cooling when scientists were fretting over the coming of another ice age! Climate data show us that continental temperatures at the South Pole never reach as high as anything close to the melting point of snow and ice. Climate data show us that, while areas near the edge of the Antarctic continent have briefly reached above the melting point of snow and ice, it is rare and only during summer months, for temperatures to exceed the melting point of snow and ice. How warm must it get to generate appreciable melting of Antarctica's 6,360,000 cubic miles of ice? I'll leave that question as an exercise for physicists to calculate a detailed answer. Those with a shred of common sense will understand that climate data for Antarctica and it's interior (South Polar region) clearly testify to the fact that for virtually the entirety of the year, the Antarctic continent is well below freezing. 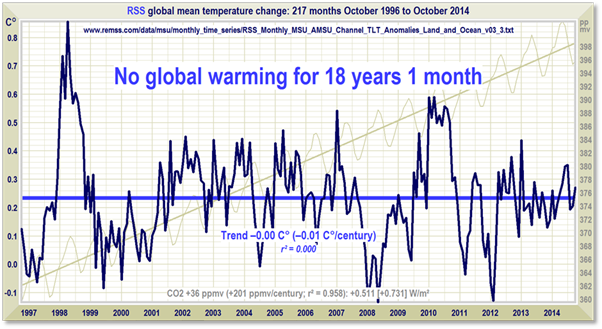 So just how and when is this "melting" from "global warming" occurring? Can there be any serious doubt of the absolute absurdity of warmist claims that the continental ice and snow cover of Antarctica are diminishing because of global warming?